After Licinius defeated Maximinus Daia in 313, and added Asia and Egypt to all of his Balkan territories, he and Constantine the Great were the two remaining rulers of the Roman Empire. At first, they tried to cooperate and rule the empire with Licinius in the East and Constantine in the West, but the agreement they had was merely out of convenience and not because they truly wanted to co-rule. 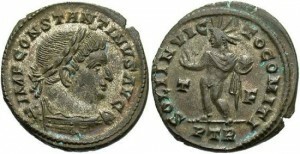 This is a category of Constantine coin. Tensions began immediately and both decided to create essentially a buffer zone in Rhaetia and Pannonia, managed by Bassianus, who was married to the sister of the wife of Licinius, and was also the half-brother-in-law to Constantine. Both saw this as fair, since his loyalty should be split evenly between the two emperors. However, Licinius managed to convince Bassianus to revolt in his favor in 315, causing Constantine to quickly leave the Rhine area and travel to Italy to deal with the situation. Constantine didn’t take any immediate action when deciding to confront the problems in the region, instead sending his half-brother, Julius Constantius, to meet with Licinius in Sirmium to discuss elevating Bassianus to Caesar, overseeing Italy. Licinius did not accept the proposal, and instead asked his brother to assassinate Constantine instead so they could rule the entire empire. The conspiracy was discovered, which led to the arrest and execution of Bassianus, and escalating hostilities finally erupting in the First Licinian War, in Autumn 316. Constantine invaded the Balkans and served a resounding defeat to Licinius on October 8, 316 AD at the Battle of Cibalae (modern day Croatia). This great battle was just the beginning of the civil wars between Licinius and Constantine – they fought for nearly a decade, until late 324 AD, when Constantine’s forces finally accepted the surrender of Licinius and Martinianus through Constantia, Licinius’s wife. Maximinus II Daza. A.D. 309-313. Æ follis. Antioch, A.D. 310.